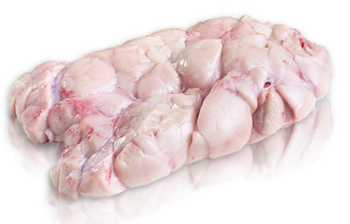 Sweetbreads are the thymus glands and/or pancreas of calves, lambs and piglets under one year old. These glands are classified as offal in culinary circles, along with other parts such as gizzards and intestines. In cookery, veal sweet breads only are considered. It is prenatally developed, of unknown function, and as soon as calf is taken from liquid food it gradually disappears. Pancreas, stomach sweetbread, is sold in some sections of the country, but in our markets this custom is not practised. Sweetbreads are a reputed table delicacy, and a valuable addition to the menu of the convalescent. A sweetbread consists of two parts, connected by tubing and membranes. The round, compact part is called the heart sweetbread, as its position is nearer the heart; the other part is called the throat sweetbread. When sweetbread is found in market separated, avoid buying two of the throat sweetbreads, as the heart sweetbread is more desirable. Sweetbreads spoil very quickly. They should be removed from paper as soon as received from market, plunged into cold water and allowed to stand one hour, drained, and put into acidulated salted boiling water then allowed to cook slowly twenty minutes; again drained, and plunged into cold water, that they may be kept white and firm. Sweetbreads are always parboiled in this manner for subsequent cooking. Parboil sweet breads in salt water; remove the skin and tough parts; cut in pieces the size of a large oyster; dip in beaten egg; roll in cracker crumbs, seasoned with salt and pepper; fry in hot butter, or drop in hot lard, as you would doughnuts. Parboil the sweet breads; cut in small squares; add to them a coffee cup of cream, pepper, salt, and a tablespoon of butter. Cook the peas tender, and add them to the sweet breads. Moisten a tablespoonful of flour with a little milk; add, and boil up once or twice just before serving.